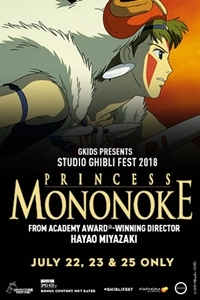 Fathom Events and GKIDS are excited to bring the epic animated fantasy film, Princess Mononoke, to movie theatres nationwide for a special three-day event on July 22, 23 & 25 as part of Studio Ghibli Fest 2018. From the legendary Studio Ghibli, creators of Spirited Away, and Academy Award®-winning director Hayao Miyazaki, comes an epic masterpiece that has dazzled audiences worldwide with its breathtaking imagination, exhilarating battles and deep humanity. The English dubbed film features the voices of Gillian Anderson, Billy Crudup, Claire Danes, Minnie Driver, Jada Pinkett Smith, and Billy Bob Thornton.